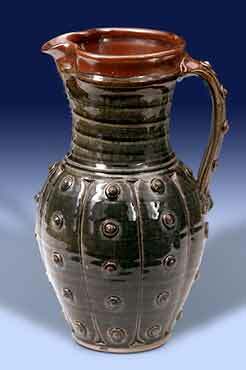 Dan Finnegan studded jug - 13" (330 mm) high, 6" (152 mm) wide. Reduction fired in a gas kiln. Dan Finnegan was born in Buffalo, New York in 1955. He studied ceramics in New York and Arizona and then in 1978 went to England to train with Ray Finch at Winchcombe Pottery. He returned to the United States in 1980 and set up a workshop at Fredericksburg, Virginia. He continued there for eleven years before moving to his current premises in downtown Fredericksburg. Dan has been a juried member of the Association of Virginia Artisans since 1993 and was a faculty member of the Torpedo Factory Art Center in Alexandria, Virginia from 1994 to 1997. In August 1997 Dan was artist-in-residence at the British Museum as part of the Pottery in the Making: World Ceramic Traditions exhibition. He has appeared in numerous publications, and his pots are found in many private and public collections. In 2000 Dan set up the Back Door Pottery across the street from his workshop as a school and an outlet for potters' supplies. He organizes slide shows, workshops and exhibitions both in the United States and the United Kingdom. Dan's output has mainly been reduction fired stoneware from his gas kiln but he has long been moving towards wood firing and salt glaze. He has nearly completed the building of a double-chambered wood-fired kiln and expects to move away from gas firing completely over the coming years.